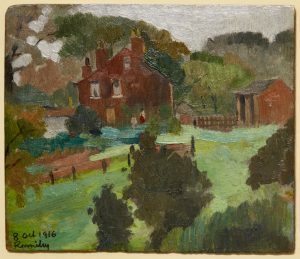 Adolphe Valette, Romiley, 1916. Photograph: Photography North West. Brief biography: 1876 – 1942. Born in Saint-Étienne, France. French impressionist artist Adolphe Valette came to England in 1904. From 1906 to 1920, Valette taught at the Municipal School of Art, All Saints – now part of Manchester School of Art, Manchester Metropolitan University, it was here he taught and inspired L.S. Lowry. Romiley was acquired by the Collection in 1971 along with Valette’s other work Figures by a Fence (1922).